Couples get in touch with me all the time to say that they have had a civil ceremony in front of a judge, Justice of the Peace or Notary Public, but they want a "real" wedding ceremony with flowers, vows, rings, champagne, the works. 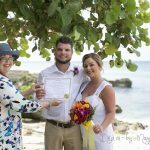 Although I am both a Justice of the Peace, and a Notary Public, in the Cayman Islands you have to be a licensed Marriage Officer to be able to perform a legal wedding, that is, a Reverend, or in my case a Civil Registrar of Marriages. 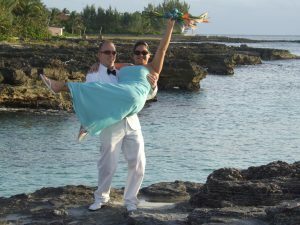 This couple from Lancaster, PA met in high school and were friends for many years. They started dating about 4 years ago, and got engaged in front of Cinderella's Castle at Disney World in October 2008. Exactly 2 years later they were married in front of a judge. 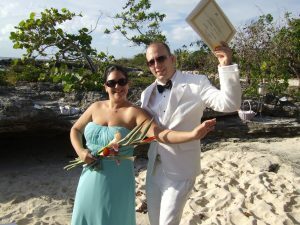 On 9th November, just two weeks after their wedding they had their "Wedding Blessing" at My Secret Cove, in Grand Cayman. 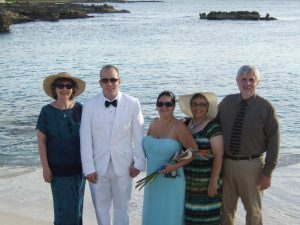 I will do a Wedding Blessing up to 2 years after your wedding, more than that I will do a Wedding Vow Renewal. The advantage of doing your ceremony at My Secret Cove is that you can get good pictures at Smith's Cove too, which is right next door. 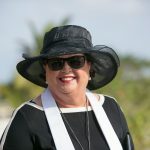 My mother Francine, was the first Civil Registrar of Marriages in the Cayman Islands. She has performed more than 2800 wedding ceremonies, and hosts of Blessings and Vow Renewals. Francine and I cover for each other all the time, and we use the same ceremonies which were written by her husband, and my dad, Vernon. 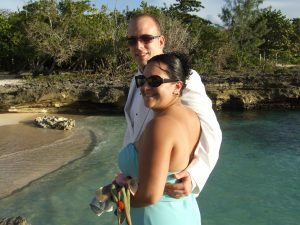 When I started Simply Weddings in 2008 it was to do cruise weddings for Cayman Weddings, my mother's company. 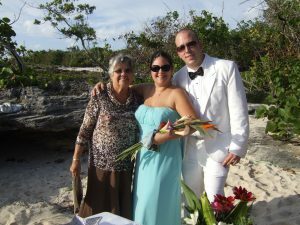 Although I do a small number of stayover and resident weddings, my main practice is with beach weddings for cruise visitors. At your Cayman Wedding Blessing you sign a certificate which records the event, it is witnessed and countersigned by your Civil Registrar of Marriages. A Wedding Blessing ceremony gives you the opportunity to have a meaningful contemporary blessing ceremony which you will cherish forever. A Wedding Blessing Ceremony has all the features of a Wedding Ceremony, except that since you are already married we do not pronounce you man and wife, and of course it is not recorded. 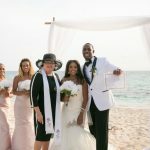 It is simply a way of marking a momentous occasion with beautiful words spoken to each other with great sincerity, and with an experienced Marriage Officer who guides you through a structured ceremony. 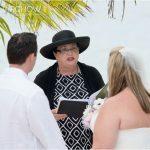 If you are visiting the Cayman Islands, and you have had a civil ceremony, please contact us and we will be happy to talk to you about the options available at a Wedding Blessing.